Part of the Tasman Peninsula, Cape Hauy sits exposed to the icy cold crashing waves of the Tasman Sea in the far south-east of Tasmania. 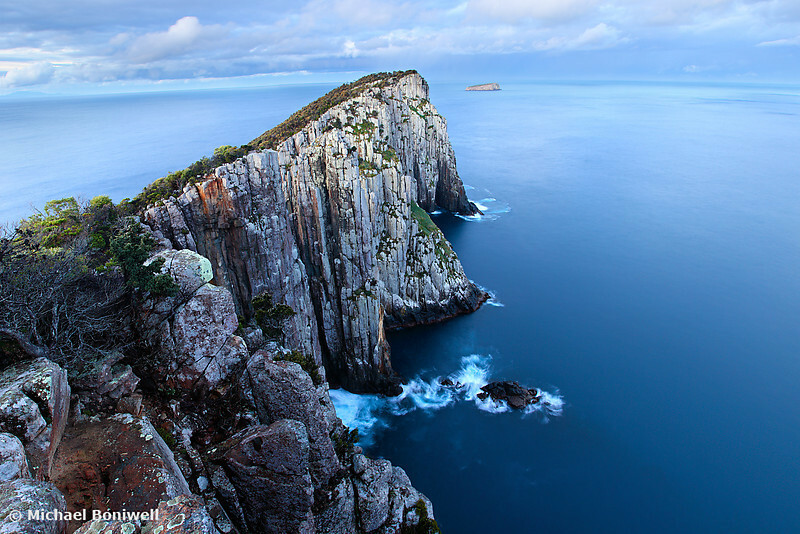 Access is via a rugged bush walk within the Tasman National Park that offers grand coastal views though little shelter from the wind and weather. During my trip I hiked from the delightful, though isolated, Fortescue Bay out to the cape fully kitted out with overnight gear and prepared to wait days for the right light. Incredibly, as night fell, a storm blew in creating a dramatic back drop to the scene. With gusts threatening to lift me off the cliff I retreated a little nook and got this shot before abandoning the precarious bluff and hiking out very happy with the shot.